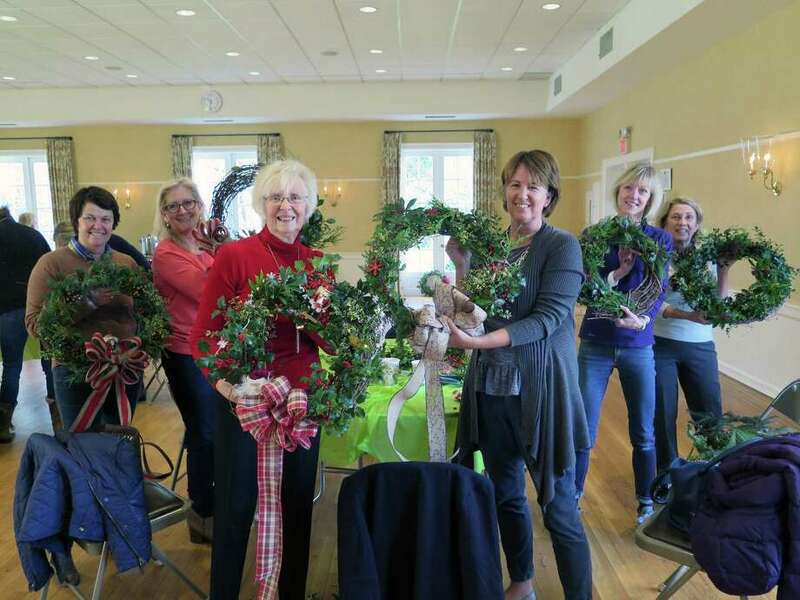 Members of the DCA’s Greenhouse Group will be hosting a holiday greens wreath workshop on Nov. 29 at 9:30 a.m.
Three new ambulances were introduced to Darien EMS-Post 53, thanks to the generosity of the McGraw and Ziegler families of Darien, and the Friends of Post. The ambulances, featuring the latest in safety and technology, were launched at a ceremony on Sept. 23. The launch ceremony included members of the McGraw family, as well as local dignitaries. The ambulances were officially “christened” by the families and town representatives with saline solution from IV bags. The process of turning donations into ambulances was the job of nine-year Post veteran, Marc McEwan, with the help of other Post 53 adult advisors. McEwan served as point person, setting ambulance specifications, placing the order, organizing radio installations and getting final inspections and registrations completed. Local artists Hanneke Goedkoop and Sandy Mills will present paintings in the upcoming “Spirit of Nature” exhibit at the Darien Nature Center. A wine and cheese opening reception will be held on Nov. 28 from 6:30 to 8 p.m. This event is free and open to the public. A portion of sales proceeds will be donated to the Nature Center. Both artists express their interpretations of nature’s imagery and sense of space and light. Goedkoop, a Rowayton resident, said her watercolor and acrylic work appears abstract but is rooted in reality. “Thoughts about evolution and the environment are represented in visual narratives. They are shaped through observation, from memories, connections with and love for nature,” Goedkoop said. Mills, a Norwalk resident, said she is inspired by the outdoors and looks for strong design and bold contrast in nature. Her paintings are in oil on aluminum and canvas. “I hope the viewer feels an emotional connection to what I’m seeing,” Mills said. The Darien Nature Center is located at 120 Brookside Road. More information can be found at dariennaturecenter.org/events. For questions, contact Administrative Affairs Manager Leah Salomoni at 203-655-7459. The Greenhouse Group will lead participants in the hands-on workshop to make a festive wreath. Bring gloves and pruners. THe group will provide fresh greens, ribbons and a variety of embellishments. Coffee and light refreshments will be served at 9:30 a.m., with the workshop starting at 10 a.m. This workshop is $30, or $20 for DCA members. Payment is required by Nov. 26 so the appropriate supplies can be purchased, and can be made through dariendca.org, or contact the DCA at info@dariendca.org or 203-655-9050 ext. 10. The DCA is located at 274 Middlesex Road, Darien. Award-winning Nashville recording artists and local country western band Gunsmoke is performing its latest Music for Hope benefit concert, A Country Christmas at the Piedmont Club in Darien on Dec. 1. Proceeds from the concert will be donated to the St. Jude Children’s Research Hospital and the Ovarian Cancer Research Fund. Also performing at the benefit is classic rock and soul band, The Law. Gunsmoke performs regularly at Broadway’s Opry City Stage and has recorded six albums, performed for two sitting presidents of the United States, and has been enshrined in the Connecticut country music hall of fame. The band was formed by brothers Jeff and Nick DeMaio Jr., of Darien, and has been performing classic country, western, swing and rockabilly music for over 25 years. Gunsmoke established Music for Hope in 2010 to raise funds to fight cancer on both the local and national level. Through concerts, dinner dances and recordings, Gunsmoke and friends have raised thousands of dollars for St. Jude’s Children’s Research Hospital, The Bennett Cancer Center at Stamford Hospital and The Whittingham Cancer Center at Norwalk Hospital. The Piedmont, Darien’s Italian American Club established in 1916, has partnered with Music for Hope and Gunsmoke in past years for their benefit concerts. This year’s menu of food available for purchase includes pasta, a steak, pepper and cheese wedge, and a meatball parmigiana wedge. Admission for the Music for Hope benefit concert is $15. Reservations or donations may be made in advance at 203-655-7884. Doors open at 6:30 p.m. for the show, which begins at 7 p.m. The Piedmont Club is located at 152 Hecker Avenue in Darien. For information, go to piedmontclub.org.